I have had some trouble, worries rather, about the safety on my computer. I was being attacked by a virus, I was thinking about a couple of friends who during the last year had their accounts hacked or whatever and they had to work hard to restore them. What I did not think about was that I have a Mac and that they have a great reputation for security and that I have also their scanning programme which, of course, I did not think to use right away. 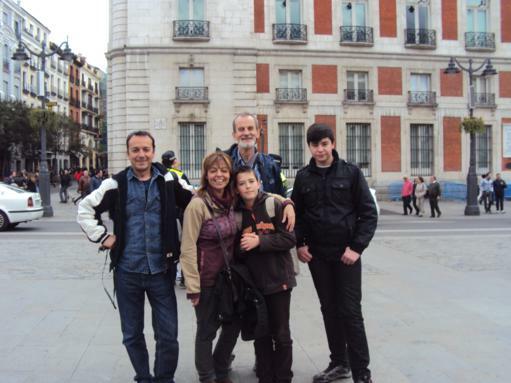 Friends came down from the north to spend time with me in Madrid, my friend Antonio, his novia, Montse and her sons, Martín and Diego, 11 and 15 respectively. Thanks, Diego, for reminding me to use my scanning programme. 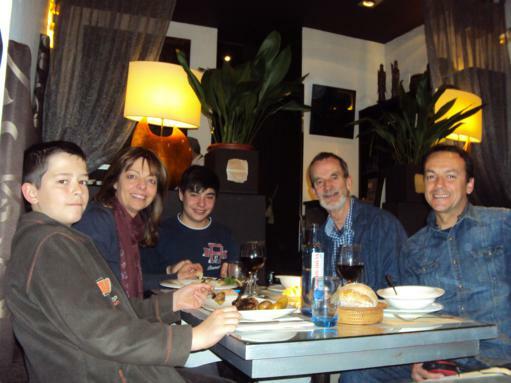 Here we are in my favourite restaurant, Sama, in central Madrid celebrating my birthday. We ate wonderfully well. 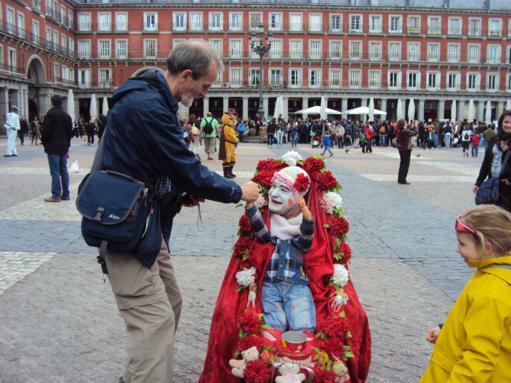 We then spent time walking around central Madrid, visiting the plazas and enjoying the people and the entertainers. Here I am with my favourite, the bratty kid; I was singing along with him. 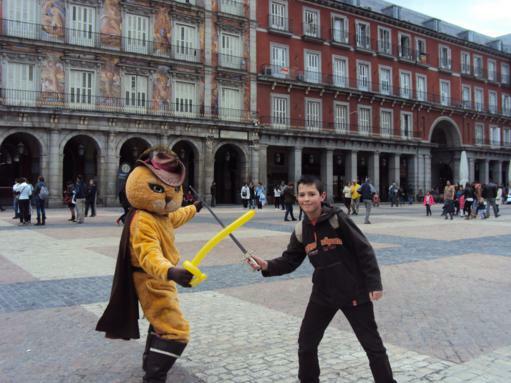 Martín is enjoying swordplay with Puss n’ Boots. 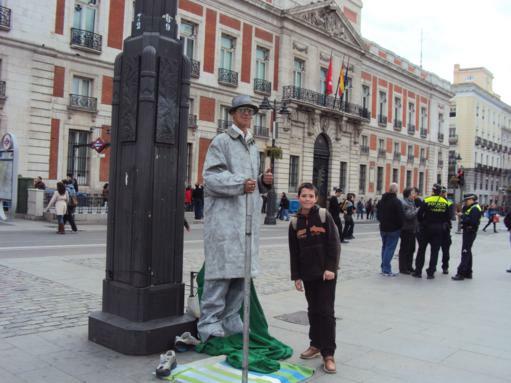 Here he is trying to figure out how this lad is able to suspend himself in mid-air. I am doing one of my necessary stretches, of course, hamming it up with Montse with Diego looking askance at adult behaviour. 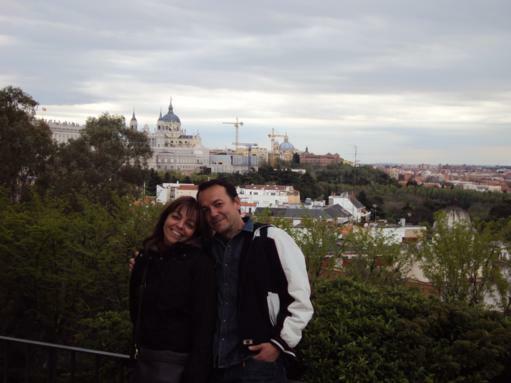 The love birds with some cathedral in the background, from a later century and of no interest to this medievalist. 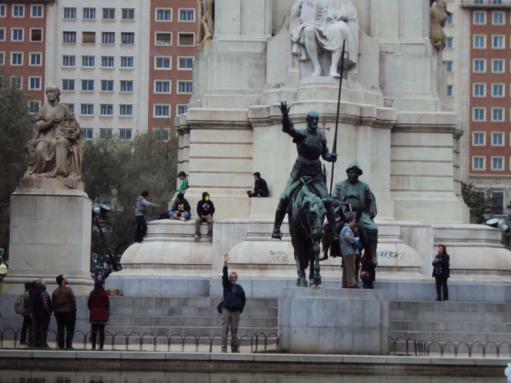 That’s me trying to be noticed next to the statue of Don Quixote in the Plaza de España. It is great to have a photographer along. I have shots of this statue of course without yours truly. 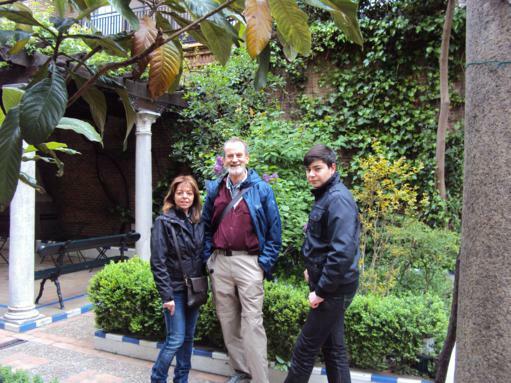 In the garden of Joaquin Sorolla’s house, an amazing late nineteenth century, early twentieth century Spanish artist. Montse is quite the artist and has painted under the inspiration of this man but had never been to this museum which is absolutely full of his work. Try this link and be ready to spend time with it; <http://museosorolla.mcu.es/visita_virtual/visita_virtual.html&gt; If it doesn’t work, simply search museosorolla visita virtual. It is one of the best that I have come across of this type. 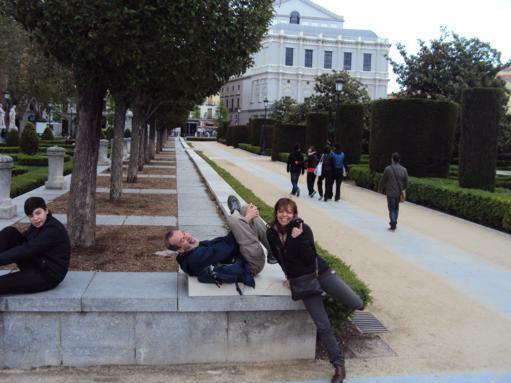 A final shot of the five of us in Plaza del Sol. Special thanks to my friends from the north, making the trek to Madrid to visit me. Sunday we were also celebrating Montse’s feast day, Santa Montserrat. The Spanish continue with this custom. This past three and a half weeks has seen many highlights but the final weekend will be the special memory. I think that it is in post #2 how it happened that the friendship between Antonio and me began. Absolute serendipity! This entry was posted in Uncategorized on April 29, 2013 by agnotarte.